At one time, humans believed that the Earth was the center of the Universe; that the Sun, Moon, planets and stars all revolved around us. It was only after centuries of ongoing observations and improved instrumentation that astronomers came to understand that we are in fact part a larger system of planets that revolve around the Sun. And it has only been within the last century that we’ve come to understand just how big our Solar System is. And even now, we are still learning. In the past few decades, the total number of celestial bodies and moons that are known to orbit the Sun has expanded. We have also come to debate the definition of “planet” (a controversial topic indeed!) and introduced additional classifications – like dwarf planet, minor planet, plutoid, etc. – to account for new finds. So just how many planets are there and what is special about them? Let’s run through them one by one, shall we? As you travel outward from the Sun, Mercury is the closest planet. It orbits the Sun at an average distance of 58 million km (36 million mi). Mercury is airless, and so without any significant atmosphere to hold in the heat, it has dramatic temperature differences. The side that faces the Sun experiences temperatures as high as 420 °C (788 °F), and then the side in shadow goes down to -173 °C (-279.4 °F). Like Venus, Earth and Mars, Mercury is a terrestrial planet, which means it is composed largely of refractory minerals such as the silicates and metals such as iron and nickel. These elements are also differentiated between a metallic core and a silicate mantle and crust, with Mercury possessing a larger-than-average core. Multiple theories have been proposed to explain this, the most widely accepted being that the impact from a planetesimal in the past blew off much of its mantle material. Mercury is the smallest planet in the Solar System, measuring just 4879 km across at its equator. However, it is second densest planet in the Solar System, with a density of 5.427 g/cm3 – which is the second only to Earth. Because of this, Mercury experiences a gravitational pull that is roughly 38% that of Earth’s (0.38 g). Mercury also has the most eccentric orbit of any planet in the Solar System (0.205), which means its distance from the Sun ranges from 46 to 70 million km (29-43 million mi). The planet also takes 87.969 Earth days to complete an orbit. But with an average orbital speed of 47.362 km/s, Mercury also takes 58.646 days to complete a single rotation. Combined with its eccentric orbit, this means that it takes 176 Earth days for the Sun to return to the same place in the sky (i.e. a solar day) on Mercury, which is twice as long as a single Hermian year. Mercury also has the lowest axial tilt of any planet in the Solar System – approximately 0.027 degrees – compared to Jupiter’s 3.1 degrees, which is the second smallest. Mercury has only been visited two times by spacecraft, the first being the Mariner 10 probe, which conducted a flyby of the planet back in the mid-1970s. It wasn’t until 2008 that another spacecraft from Earth made a close flyby of Mercury (the MESSENGER probe) which took new images of its surface, shed light on its geological history, and confirmed the presence of water ice and organic molecules in its northern polar region. In summary, Mercury is made special by the fact it is small, eccentric, and varies between extremes of hot and cold. It’s also very mineral rich, and quite dense! Venus is the second planet in the Solar System, and is Earth’s virtual twin in terms of size and mass. With a mass of 4.8676×1024 kg and a mean radius of about 6,052 km, it is approximately 81.5% as massive as Earth and 95% as large. Like Earth (and Mercury and Mars), it is a terrestrial planet, composed of rocks and minerals that are differentiated. But apart from these similarities, Venus is very different from Earth. Its atmosphere is composed primarily of carbon dioxide (96%), along with nitrogen and a few other gases. This dense cloud cloaks the planet, making surface observation very difficult, and helps heat it up to 460 °C (860 °F). The atmospheric pressure is also 92 times that of Earth’s atmosphere, and poisonous clouds of carbon dioxide and sulfuric acid rain are commonplace. Venus orbits the Sun at an average distance of about 0.72 AU (108 million km; 67 million mi) with almost no eccentricity. In fact, with its farthest orbit (aphelion) of 0.728 AU (108,939,000 km) and closest orbit (perihelion) of 0.718 AU (107,477,000 km), it has the most circular orbit of any planet in the Solar System. The planet completes an orbit around the Sun every 224.65 days, meaning that a year on Venus is 61.5% as long as a year on Earth. When Venus lies between Earth and the Sun, a position known as inferior conjunction, it makes the closest approach to Earth of any planet, at an average distance of 41 million km. This takes place, on average, once every 584 days, and is the reason why Venus is the closest planet to Earth. The planet completes an orbit around the Sun every 224.65 days, meaning that a year on Venus is 61.5% as long as a year on Earth. Unlike most other planets in the Solar System, which rotate on their axes in an counter-clockwise direction, Venus rotates clockwise (called “retrograde” rotation). It also rotates very slowly, taking 243 Earth days to complete a single rotation. This is not only the slowest rotation period of any planet, it also means that a single day on Venus lasts longer than a Venusian year. Venus’ atmosphere is also known to experience lightning storms. Since Venus does not experience rainfall (except in the form of sulfuric acid), it has been theorized that the lightning is being caused by volcanic eruptions. Several spacecraft have visited Venus, and a few landers have even made it to the surface to send back images of its hellish landscape. Even though there were made of metal, these landers only survived a few hours at best. Venus is made special by the fact that it is very much like Earth, but also radically different. It’s thick atmosphere could crush a living being, its heat could melt lead, and its acid rain could dissolve flesh, bone and metal alike! It also rotates very slowly, and backwards relative to the other plants. Earth is our home, and the third planet from the Sun. With a mean radius of 6371 km and a mass of 5.97×1024 kg, it is the fifth largest and fifth most-massive planet in the Solar System. And with a mean density of 5.514 g/cm³, it is the densest planet in the Solar System. Like Mercury, Venus and Mars, Earth is a terrestrial planet. 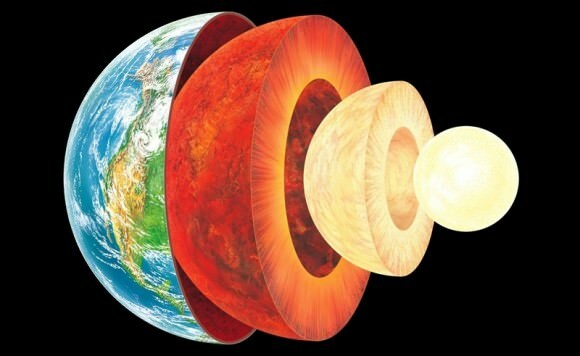 But unlike these other planets, Earth’s core is differentiated between a solid inner core and liquid outer core. The outer core also spins in the opposite direction as the planet, which is believed to create a dynamo effect that gives Earth its protective magnetosphere. Combined with a atmosphere that is neither too thin nor too thick, Earth is the only planet in the Solar System known to support life. The Earth has an orbital period of 365.25 days, which is the equivalent of 1.000017 Julian years. This means that every four years (in what is known as a Leap Year), the Earth calendar must include an extra day. Though a single solar day on Earth is considered to be 24 hours long, our planet takes precisely 23h 56m and 4 s to complete a single sidereal rotation (0.997 Earth days). Earth’s axis is also tilted 23.439281° away from the perpendicular of its orbital plane, which is responsible for producing seasonal variations on the planet’s surface with a period of one tropical year (365.24 solar days). In addition to producing variations in terms of temperature, this also results in variations in the amount of sunlight a hemisphere receives during the course of a year. Earth has only a single moon: the Moon. Thanks to examinations of Moon rocks that were brought back to Earth by the Apollo missions, the predominant theory states that the Moon was created roughly 4.5 billion years ago from a collision between Earth and a Mars-sized object (known as Theia). This collision created a massive cloud of debris that began circling our planet, which eventually coalesced to form the Moon we see today. What makes Earth special, you know, aside from the fact that it is our home and where we originated? It is the only planet in the Solar System where liquid, flowing water exists in abundance on its surface, has a viable atmosphere, and a protective magnetosphere. In other words, it is the only planet (or Solar body) that we know of where life can exist on the surface. In addition, no planet in the Solar System has been studied as well as Earth, whether it be from the surface or from space. Thousands of spacecraft have been launched to study the planet, measuring its atmosphere, land masses, vegetation, water, and human impact. Our understanding of what makes our planet unique in our Solar System has helped in the search for Earth-like planets in other systems. The fourth planet from the Sun is Mars, which is also the second smallest planet in the Solar System. It has a radius of approximately 3,396 km at its equator, and 3,376 km at its polar regions – which is the equivalent of roughly 0.53 Earths. While it is roughly half the size of Earth, it’s mass – 6.4185 x 10²³ kg – is only 0.151 that of Earth’s. It’s density is also lower than Earths, which leads to it experiencing about 1/3rd Earth’s gravity (0.376 g). It’s axial tilt is very similar to Earth’s, being inclined 25.19° to its orbital plane (Earth’s axial tilt is just over 23°), which means Mars also experiences seasons. Mars has almost no atmosphere to help trap heat from the Sun, and so temperatures can plunge to a low of -140 °C (-220 °F) in the Martian winter. However, at the height of summer, temperatures can get up to 20 °C (68 °F) during midday at the equator. However, recent data obtained by the Curiosity rover and numerous orbiters have concluded that Mars once had a denser atmosphere. Its loss, according to data obtained by NASA’s Mars Atmosphere and Volatile Evolution (MAVEN), the atmosphere was stripped away by solar wind over the course of a 500 million year period, beginning 4.2 billion years ago. At its greatest distance from the Sun (aphelion), Mars orbits at a distance of 1.666 AUs, or 249.2 million km. At perihelion, when it is closest to the Sun, it orbits at a distance of 1.3814 AUs, or 206.7 million km. At this distance, Mars takes 686.971 Earth days, the equivalent of 1.88 Earth years, to complete a rotation of the Sun. In Martian days (aka. Sols, which are equal to one day and 40 Earth minutes), a Martian year is 668.5991 Sols. Like Mercury, Venus, and Earth, Mars is a terrestrial planet, composed mainly of silicate rock and metals that are differentiated between a core, mantle and crust. The red-orange appearance of the Martian surface is caused by iron oxide, more commonly known as hematite (or rust). The presence of other minerals in the surface dust allow for other common surface colors, including golden, brown, tan, green, and others. Although liquid water cannot exist on Mars’ surface, owing to its thin atmosphere, large concentrations of ice water exist within the polar ice caps – Planum Boreum and Planum Australe. In addition, a permafrost mantle stretches from the pole to latitudes of about 60°, meaning that water exists beneath much of the Martian surface in the form of ice water. Radar data and soil samples have confirmed the presence of shallow subsurface water at the middle latitudes as well. Mars has two tiny asteroid-sized moons: Phobos and Deimos. Because of their size and shape, the predominant theory is that Mars acquired these two moons after they were kicked out of the Asteroid Belt by Jupiter’s gravity. Mars has been heavily studied by spacecraft. There are multiple rovers and landers currently on the surface and a small fleet of orbiters flying overhead. Recent missions include the Curiosity Rover, which gathered ample evidence on Mars’ water past, and the groundbreaking discovery of finding organic molecules on the surface. Upcoming missions include NASA’s InSight lander and the Exomars rover. Hence, Mars’ special nature lies in the fact that it also is terrestrial and lies within the outer edge of the Sun’s habitable zone. And whereas it is a cold, dry place today, it once had an thicker atmosphere and plentiful water on its surface. Mighty Jupiter is the fouth planet for our Sun and the biggest planet in our Solar System. Jupiter’s mass, volume, surface area and mean circumference are 1.8981 x 1027 kg, 1.43128 x 1015 km3, 6.1419 x 1010 km2, and 4.39264 x 105 km respectively. To put that in perspective, Jupiter diameter is roughly 11 times that of Earth, and 2.5 times the mass of all the other planets in the Solar System combined. However, Jupiter’s rotation is the fastest of all the Solar System’s planets, completing a rotation on its axis in slightly less than ten hours (9 hours, 55 minutes and 30 seconds to be exact). Therefore, a single Jovian year lasts 10,475.8 Jovian solar days. This orbital period is two-fifths that of Saturn, which means that the two largest planets in our Solar System form a 5:2 orbital resonance. Jupiter has been visited by several spacecraft, including NASA’s Pioneer 10 and Voyager spacecraft in 1973 and 1980, respectively; and by the Cassini and New Horizons spacecraft more recently. Until the recent arrival of Juno, only the Galileo spacecraft has ever gone into orbit around Jupiter, and it was crashed into the planet in 2003 to prevent it from contaminating one of Jupiter’s icy moons. In short, Jupiter is massive and has massive storms. But compared to the planets of the inner Solar System, is it significantly less dense. Jupiter also has the most moons in the Solar System, with 67 confirmed and named moons orbiting it. But it is estimated that as many as 200 natural satellites may exist around the planet. Little wonder why this planet is named after the king of the gods. Saturn is the second largest planet in the Solar System. With a mean radius of 58232±6 km, it is approximately 9.13 times the size of Earth. And at 5.6846×1026 kg, it is roughly 95.15 as massive. However, since it is a gas giant, it has significantly greater volume – 8.2713×1014 km3, which is equivalent to 763.59 Earths. As a gas giant, the outer atmosphere of Saturn contains 96.3% molecular hydrogen and 3.25% helium by volume. Trace amounts of ammonia, acetylene, ethane, propane, phosphine and methane have been also detected in Saturn’s atmosphere. Like Jupiter, it also has a banded appearance, but Saturn’s bands are much fainter and wider near the equator. On occasion, Saturn’s atmosphere exhibits long-lived ovals that are thousands of km wide, similar to what is commonly observed on Jupiter. Whereas Jupiter has the Great Red Spot, Saturn periodically has what’s known as the Great White Spot (aka. Great White Oval). This unique but short-lived phenomenon occurs once every Saturnian year, roughly every 30 Earth years, around the time of the northern hemisphere’s summer solstice. Of course, the most amazing feature of Saturn is its rings. These are made of particles of ice ranging in size from a grains of sand to the size of a car. Some scientists think the rings are only a few hundred million years old, while others think they could be as old as the Solar System itself. Saturn has been visited by spacecraft 4 times: Pioneer 11, Voyager 1 and 2 were just flybys, but Cassini has actually gone into orbit around Saturn and has captured thousands of images of the planet and its moons. And speaking of moons, Saturn has a total of 62 moons discovered (so far), though estimates indicate that it might have as many as 150. So like Jupiter, Saturn is a massive gas giant that experiences some very interesting weather patterns. It also has lots of moons and has a very low density. But what really makes Saturn stand out is its impressive ring system. Whereas every gas and ice giant has one, Saturn’s is visible to the naked eye and very beautiful to behold! Next comes Uranus, the seventh planet from the Sun. With a mean radius of approximately 25,360 km and a mass of 8.68 × 1025 kg, Uranus is approximately 4 times the sizes of Earth and 63 times its volume. However, as a gas giant, its density (1.27 g/cm3) is significantly lower; hence, it is only 14.5 as massive as Earth. The rotational period of the interior of Uranus is 17 hours, 14 minutes. As with all giant planets, its upper atmosphere experiences strong winds in the direction of rotation. Hence its weather systems are also broken up into bands that rotate around the planet, which are driven by internal heat rising to the upper atmosphere. As a result, winds on Uranus can reach up to 900 km/h (560 mph), creating massive storms like the one spotted by the Hubble Space Telescope in 2012. Similar to Jupiter’s Great Red Spot, this “Dark Spot” was a giant cloud vortex that measured 1,700 kilometers by 3,000 kilometers (1,100 miles by 1,900 miles). Uranus was the first planet to be discovered with a telescope; it was first recognized as a planet in 1781 by William Herschel. Beyond Earth-based observations, only one spacecraft (Voyager 2) has ever studied Uranus up close. It passed by the planet in 1986, and captured the first close images. Uranus has 27 known moons. Uranus’ special nature comes through in its natural beauty, its intense weather, its ring system and its impressive array of moons. And it’s compositions, being an “ice” giant, is what gives its aquamarine color. But perhaps mist interesting is its sideways rotation, which is unique among the Solar planets. Neptune is the 8th and final planet in the Solar System, orbiting the Sun at a distance of 29.81 AU (4.459 x 109 km) at perihelion and 30.33 AU (4.537 x 109 km) at aphelion. With a mean radius of 24,622 ± 19 km, Neptune is the fourth largest planet in the Solar System and four times as large as Earth. But with a mass of 1.0243×1026 kg – which is roughly 17 times that of Earth – it is the third most massive, outranking Uranus. Just like Jupiter and Saturn, Neptune has bands of storms that circle the planet. Astronomers have clocked winds on Neptune traveling at 2,100 km/hour, which is believed to be due to Neptune’s cold temperatures – which may decrease the friction in the system, During its 1989 flyby, NASA’s Voyager 2 spacecraft discovered the Great Dark Spot on Neptune. Similar to Jupiter’s Great Red Spot, this is an anti-cyclonic storm measuring 13,000 km x 6,600 km across. A few years later, however, the Hubble Space Telescope failed to see the Great Dark Spot, but it did see different storms. This might mean that storms on Neptune don’t last as long as they do on Jupiter or even Saturn. The more active weather on Neptune might be due, in part, to its higher internal heat. Although Neptune is much more distant than Uranus from the Sun, receiving 40% less sunlight, temperatures on the surface of the two planets are roughly similar. In fact, Neptune radiates 2.61 times as much energy as it receives from the Sun. This is enough heat to help drive the fastest winds in the Solar System. Neptune is the second planet discovered in modern times. It was discovered at the same time by both Urbain Le Verrier and John Couch Adams. Neptune has only ever been visited by one spacecraft, Voyager 2, which made a fly by in August, 1989. Neptune has 13 known moons. Th largest and most famous of these is Triton, which is believed to be a former KBO that was captured by Neptune’s gravity. So much like Uranus, Neptune has a ring system, some intense weather patterns, and an impressive array of moons. Also like Uranus, Neptune’s composition allows for its aquamarine color; except that in Neptune’s case, this color is more intense and vivid. In addition, Neptune experiences some temperature anomalies that are yet to be explained. And let’s not forgt the raining diamonds! And those are the planets in the Solar System thank you for joining the tour! Unfortunately, Pluto isn’t a planet any more, hence why it was not listed. We know, we know, take it up with the IAU! 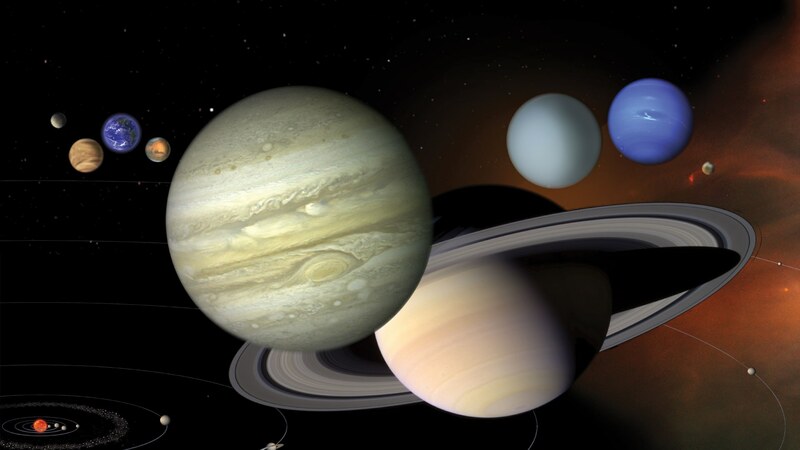 We have written many interesting articles about the Solar System here at Universe Today. Here’s the Solar System Guide, What is the Solar System?, Interesting Facts About the Solar System, What Was Here Before the Solar System?, How Big is the Solar System?, and Is the Solar System Really a Vortex? If you’d like more information on the Solar System, visit the Nine Planets, and Solar Views. Is there any reason most of it is bold? Or did my browser load it incorrectly?